Gymnastricks was originally a German book, this is why this website is mainly German. But as I am ever so happy and proud to be able to translate my book into English myself, there had to be an English online version, too – of course! Gymnastricks is a unique programme that combines sensible exercises to help keep your dog healthy with great tricks for you both to enjoy. Your dog’s fitness will be increased and his muscles will be built up and kept in shape. 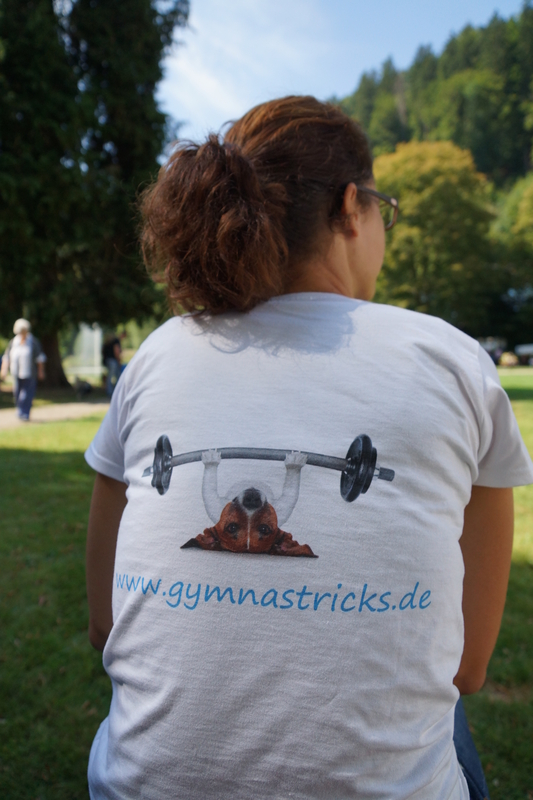 You can use the “Gymnastricks” as warm-up before any kind of dog sport, as training for your older or retired dog, as body awareness exercises for your youngster or in order to target a specific group of muscles after an operation. Each exercise is accompagnied by the group of muscles it targets. And the best is: you don’t need special equipment for these exercises, you can start right away! But it’s not only your dog’s body that will be trained, his mind will be kept going, too. He’s asked to actively engage in this programme instead of being passive. This book offers so many ideas for everyone who wants to do something for their dog’s fitness and have a lot of fun along the way! Carmen Mayer owns 2 beagles and is actively involved in the sports canine freestyle in Germany, be it as competitor, judge or chaiperson for a European association of canine freestyle enthusiasts. She is a huge fan of clicker training and has completed CAP2 of Kay Laurence’s clicker trainer programme. As her older dog “Lou” developed hip dysplasia, she had the idea to use some canine freestyle elements in order to build up more muscles. Together with intensive study of this field via seminars, books and dvds, she developed further exercises in order to target special muscle groups individually.